Summary and Definition: The Chinook tribe were great fishers and traders who were located along the Columbia River to the Pacific Ocean. The Chinook tribe lived off the produce from the river and ocean and constructed their plankhouses and canoes from the abundant Red Cedar trees. Many items of their clothing were also made from the bark of the cedar trees. What was the lifestyle and culture of the Chinook tribe? The Chinook tribe were an important Native American Indian people who controlled the mouth of the northern mouth of the Columbia river. The Chinook people were organized into settlements of plankhouses, rather than tribes. The Northwest people used tattoos to decorate their skins and and re-shaped their heads according to the customs of their people. This drastic change in their appearance led to the nickname of 'Flatheads'. The Chinooks were a friendly and inoffensive people who were naturally curious. Where did the Chinook tribe live? The Chinook are people of the Northwest Coast Native American cultural group. The geography of the region in which they lived dictated the lifestyle and culture of the Chinook tribe. What did the Chinook tribe live in? The Chinook tribe lived in plankhouses, also called simply 'Big Houses'. The plankhouse was constructed from the red cedar trees that were so abundant in their area. The were skilled in splitting slabs from the straight-grained red cedar trees. The houses were built in various sizes. These could range from which were from 20 to 60 feet wide and from 50 to 150 feet long. The plankhouses were built over a pit that was 4-5 feet deep and roughly the same size as the dwelling. The Native Indians had no metal nails to hold the logs together so they used wooden pegs instead. To keep the rain out, they overlapped the wooden planks. There were no windows in the plankhouse but there were roof slots that let fresh air in, and smoke from cooking fires out. The Chinook plankhouse were partitioned lodges. The interior had a central communal space. Sleeping and storage space was created by using wooden dividers and animal skins. What language did the Chinook tribe speak? The Chinook tribe spoke in the Chinookan and Penutian language. Penutian encompassed a large division of languages spoken in the Pacific northwest, near the Columbia River basin, including Chinookan, Oregon Penutian, Tsimshianic and Utian. Language proved a problem when trading and as many as six languages had to be interpreted before the people were understand each other. Both the Chinook Native Indians and white traders tried to overcome communication difficulties by creating trade jargons combining words from both Native Indian and European languages. The Northwest Native Indians used, what became referred to as the Chinook Jargon. What transportation did the Chinook use? The Chinook tribe used canoes made of birch bark. Birch bark is a strong and water-resistant bark that can be easily bent, cut and sewn. This made birch bark ideal for making the birch bark canoes that were so important for the Chinook way of life. Although called a birch bark canoe the bark from cedar trees was also used in the same way. The Chinook hollowed logs with fire and then bark was stretched over a strong, but lightweight, wooden frame to make the canoe that could be easily steered. The bark canoe was perfect for travel along fast streams and shallow waters and were sturdy enough for the rough waters of the bays near the Columbia River. The Chinook were also skilled in building the big seagoing whaling canoes. The Chinook were referred to as the "Canoe indians" who buried their dead in canoes together with their personal effects to them on the journey to the afterlife. What clothes did the Chinook wear? Their clothes reflected the season. During the hot summers they wore little or no clothing except for perhaps a breechcloth. The rain-drenched season required clothing to help them keep dry. The cardboard-like qualities of cedar bark was extremely useful and also used for making different types of water-resistant clothing. The inner bark of the cedar tree served as raw material for many of their clothes. The women of the Chinook tribe pounded the cedar bark into shreds and made fringed aprons, skirts and short capes for themselves and raincoats for the men. They also wove hats for the Chinook men made of cedar-fiber complete with a brim to shield them from the heavy rains. In the cold winter capes of fur were also worn. The men also wore clothes described as a small robe, reaching to the middle of the thigh, tied by a string across the breast, with its corners hanging loosely over their arms. Those most esteemed clothes of the Chinook tribe were made of strips of twisted sea-otter skin, which were interwoven with silk-grass, or the bark of the cedar, in such a way that the fur appeared equally on both sides, providing a soft and warm covering. The skin of the beaver or racoon was also used in the same way. Blankets woven with the fingers were made from the wool of their native sheep or acquired by trade from the Europeans. The Chinook greatly admired the clothes worn by Europeans and their was brisk trade for all items of western clothing. The Chinook enjoyed wearing jewelry, especially necklaces that were made of beaver teeth, bear claws, clamshells and bits of mother of pearl albacore shells. Jewelry was popular for decoration for both men and women, but was also worn to symbolize wealth. Another favorite decoration were coarse blue or white beads, which are folded very tightly round their wrists and ankles, to the width of 3 - 4 inches, or worn in large loose rolls round the neck. Earrings were also worn and the men also favored nose rings. What food did the Chinook tribe eat? The mainstay of the food that the Chinook tribe was fish, especially salmon. The Chinook devised many kinds of nets, lines, rakes, hooks, fish-baskets and traps which made them skilled fishermen, but the most common method of securing fish was by spearing. The women of the Chinook tribe preserved their food by smoking a year's supply of salmon. They also pressed the rich oil from the eulachon (candlefish) and used large amounts of this oil as a dip for their food. Eulachon oil, commonly referred to as 'grease' was also used for trade with the Europeans - hence the term term for a trade route was a 'grease trail'. Shellfish was another popular food and clams were dug from the beach and then smoked. 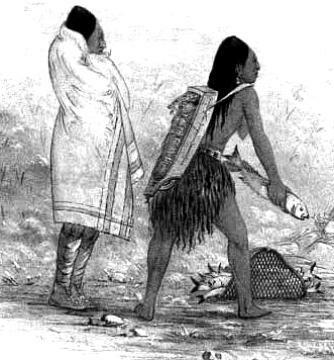 The fish was supplemented by the meat obtained from hunting the animals in the region and camas bulbs (onions), wapato (Indian potato), berries, roots and seeds gave additional variety and nutrition to the food eaten by the Chinook people. What weapons did the Chinook use? The Chinook tribe were not generally a war-like people and their weapons were usually used for hunting purposes. During times of conflict they were known to capture slaves, but on the whole their slaves were treated kindly. The men traveled to the mountains to hunt deer, elk, mountain goat, and bear for hides and meat. The weapons were used by the Chinook tribe were spears, knives, bows and arrows and clubs. Unlike most other Native Indian tribes the Chinook used a form of defensive clothing called a clamon which was like a breastplate made from hardened elk hide and cedar bark and was designed to protect the wearer from arrow fire. What was the religion and beliefs of the Chinook tribe? The religion and beliefs of the Chinook tribe was based on the belief in a Great Spirit and consisted of a mythology based on protective spirits and animal deities. One of their most important rituals of the Chinook tribe was the First Salmon feast which honored the salmon. The Chinook believed that the salmons chose to sacrifice themselves for human beings so that their spirits could go on to live again like humans, in houses under the sea. One of the most common customs of the Chinook was the potlatch. The Potlatch ceremony involved dancing and gift-giving. The dancers often wore animal masks and decorated themselves with paint and feathers. For additional facts and information refer to the Potlatch Ceremony. The Shaman and the practise of Shamanism was also important to traditional religious and healing practices of the Chinook tribe. Who were the most famous leaders and chiefs of the Chinook tribe? The most famous leaders and chiefs of the Chinook tribe included Chief Tumulth and Chief Comcomly (1765 � 1830). Chinook History: What happened to the Chinook tribe? The modern day Chinook people live in the towns of Bay Center, Chinook, and Ilwaco, Pacific County in southwest Washington.